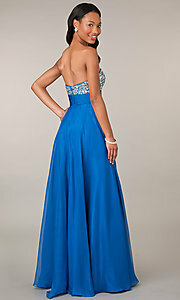 This beautiful full length strapless sweetheart formal gown is a prom perfect look for your special night. A long flowing strapless beaded gown by Alyce featuring glittering embellishments on the fitted bodice with a wide ruched waistband for a flattering silhouette. The full length silky chiffon skirt is full and fabulous and perfect for dancing at prom or formal.